The New Word in Logic Puzzle Game Making! A brilliant idea gave a new birth to the remarkable super-hit known as Lines. The game board raised ALMOST VERTICALLY, and the appeal of the game as well as its dramatic nature has increased. The strategy of the game however got much easier, having transformed somewhat difficult Lines into simply FANTASTICALLY easy, real cool columns! Besides, Coolumns games pack presents you 10 original ways to receive new pleasure from the good old Lines! Overview: Protect cool columns from filling up completely in 10 puzzle games. Take out pieces of the columns and make one-colour lines of them. Such lines disappear, increasing your score and freeing the board. 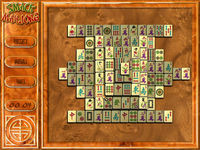 For one turn it is possible to take out the different number of pieces, depending on game. Full version features: Unlimited games play. Play in 10 different games levels. Undo and Redo up to 80 turns of games. Save your games to start where you left off. 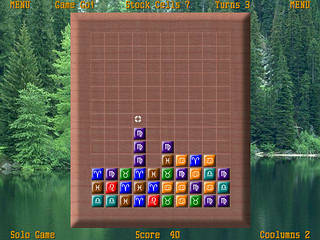 Customize the background and gameboards design. Amazing full screen graphics. Record your 120 top scores.